Our company has gained immense experience in the field of presenting Suspension Files. Matching up with the exact requirements of customers, we are involved in presenting wide array of Suspension File/Hanging File/Visa file. Made out of 400gsm craft board with steel channel & plastic bushes..
We made quality filing folders for filing cabinets, compactors, cupboards and lateral filing systems. We offer highly qualitative file suspension folder to our esteemed clients. Our range is made of supreme quality leather and is available in different sizes and alluring shapes. They are widely appreciated for its striking look, paper quality and smooth edges. We also offer customization services on the products as per the specifications. We provide suspension files that are manufactured using quality raw material. These are available in different colors and sizes. We can further customize these on the basis of color, size and other parameters as specified by our customers. Our premium quality suspension files are known for durability and easy to carry light weight features. We are one of the leading traders and suppliers of cabinet & Suspension Files. These are available in various exclusive designs, striking colors and latest patterns with perfect finish. The offered files are highly appreciated by our clients due to their high quality, excellent durability and light weight. We are looking for South India queries. We are engaged in offering a best quality of paper suspension file. We Sell Paper File Folder in Hanging Design. 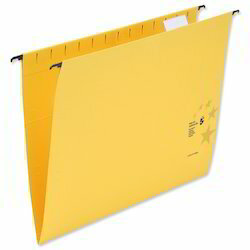 These quality hanging folders are the popular choice for desk drawer files. Each hanging folder keeps papers neatly vertical in the file. The clear vinyl tabs can be positioned in several locations on the front or back panel. Designed for filing your documents more easier clearer and tidier.